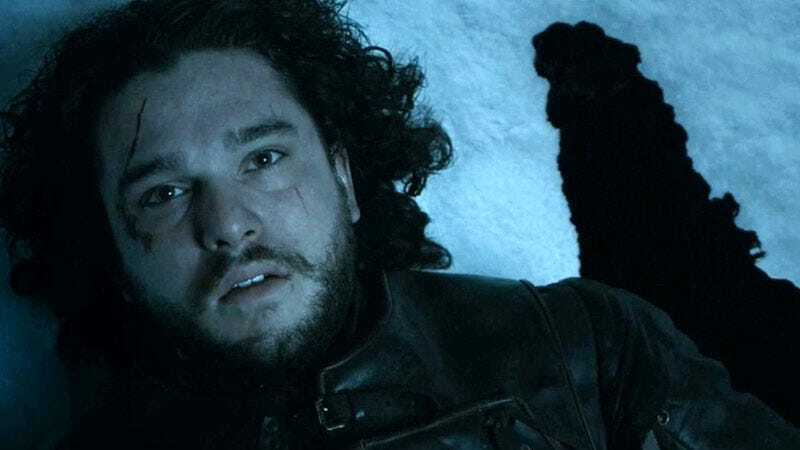 Jon Snow, formerly one of Westeros’ most eligible bachelors, died during the finale of Game of Thrones’ fifth season. After months of speculation (more like “specu-bae-tion!”) about our would-be hero, HBO has just confirmed the state of his body in the official synopsis for this month’s Season 6 premiere, released Thursday. You hear that? Jon Snow. Is. Dead. The thing is, though, “dead” doesn’t mean anything in a fantasy world where people are known to drift in and out of life via spells or sorcery or whatever it is evil Tori Amos is capable of. So quit trying to shut your fans up, HBO. Nothing you say will convince us that you and George R.R. Martin aren’t about to do something sneaky, like bring Snow back as a clingy and impressively coiffed ghost who craves vengeance.